Hello, dear readers! I'm still in San Francisco, having a ball with my friends and stuffing my face with bread from Tartine. Speaking of having a ball, I've asked the always amazing and super creative Jenny from Hank + Hunt to guest post today. The topic du jour? Parties and planning tips and tricks, of course! After all, 'tis the season to celebrate. Don't Jenny's picks just make you so excited for the holidays?! Great job, Jenny! 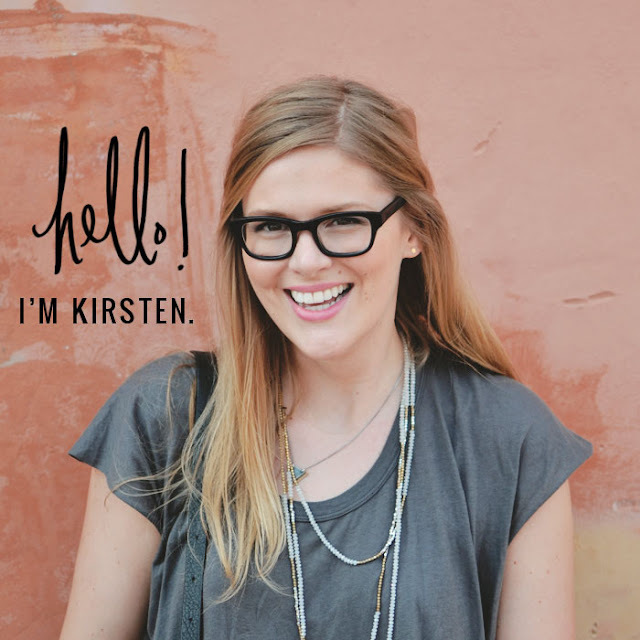 Hi, I’m Jenny from Hank + Hunt, and I was so happy when Kirsten invited me to do a guest post. This little batch of lovely is at the top of my daily reader! 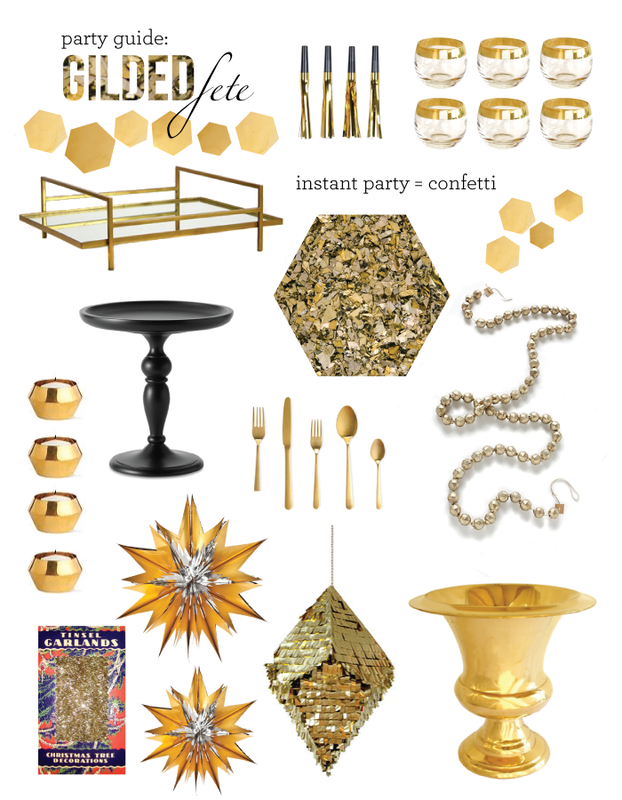 She asked if I would give some advise on holiday parties and I thought I would do a little party roundup for some golden party supplies. Gold works like a neutral in your party decor, but adds more panache and sophistication. Whether you add small bits or a lot, it can turn any color into a festive holiday. Pair it with turquoise or a deep emerald or even neon pink for a modern fete. I love it paired with black and white. I just had a gilded birthday, and there was oodles of gold, everywhere. The more the better. What to know the secret to throwing a fabulous fete? Make it simple. First, pick out what you will serve, your table will reflect either a dinner party or a cocktail buffet. Do you have neutral dishes you can use? Simple white dishes and serveware can be used for ANYTHING. Don’t forget cake stands and servers. For a more modern take on neutral dishes, get a set in black. I have a trio of black stands and they really add that little extra zing, while still being neutral enough for most palettes. Once you know what you are serving, mock up your table and buffet today. This will save you tons of time. You will get a visual of what you have, what you need, and what isn’t going to work. Planning a ton of tiny canapes or cupcakes? No platters? By doing your layout in advance, you can make a choice to either buy a bunch of platters, measuring available real estate on the tabletop, or change your foods. Visually seeing your setup, lets you assess the decorations needed. Do you need two arrangements on the buffet? Should you hang garland or sprinkle confetti down the center of your table? Do you need different linens? Planning ahead makes setup on the day of, more relaxed and enjoyable. Read: no surprises! Yay, you worked out all the kinks; all that’s left is the fun part. Now you are ready to go shopping, you have a plan, a list and a vision. Here is a little round up of some pretty little gilded items...enjoy! I feel so lucky! Just picked up 4 of those vintage glasses (in silver) for 50 cents each!!! Love a little glam! Great tips, Jenny! WOW!! This round up of gold accessories is just FANTASTIC!!! Holy moly! This collection is amazeballs! I want to get some of those gold glasses but the site isn't working! Oh shoot. But I love this!